Mountain hares (Lepus timidus) are regularly harvested on Scottish moorland managed for recreational hunting of red grouse (Lagopus lagopus scotica). 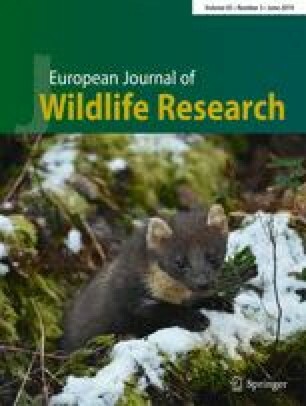 There are concerns that large-scale culls of mountain hares on grouse moors are contributing to population declines of mountain hares in Scotland. We use hare data collected during red grouse counts in Scotland, to consider spatial and temporal variation in annual mountain hare indices of spring abundance in relation to different grouse management intensities, classified as either ‘Driven’ (driven grouse shooting), ‘Walked-up’ (walked-up shooting) or ‘Not-shot’ (where there was no grouse shooting interest). Trends in mountain hare abundance indices varied with region and grouse management intensity. Hare indices were higher and relatively stable on moors where driven grouse shooting was practised relative to lower indices and declines on moors where grouse were either walked-up or not shot. Abundance indices fluctuated over time in a quasi-cyclical manner, fluctuations being more pronounced where hares were more abundant, i.e. on driven grouse moors. Density-dependent processes such as resource competition and parasitism could explain greater fluctuations in areas where hare abundance indices were higher, whilst reductions in indices over time probably reflect sampling at decline phases of the cycle, particularly on driven moors, rather than being part of true long-term declines. Given our understanding of grouse moor management and mountain hare ecology, enhanced habitat management and control of generalist predators seem to be the most parsimonious explanation for higher abundances indices of mountain hare on driven grouse moors. We thank all estate owners and land managers who provided access and allowed us to collect the data. We also thank Alan Kirby, Allan Macleod, Will Bartholomew, Graeme Neish, Kayleigh Hogg, Ella Steel, Laura Taylor, Lois Canham, Martin Dallimer and Adam Berry for their contributions to the data collection.